Very beautiful vase idea for summer or spring season. 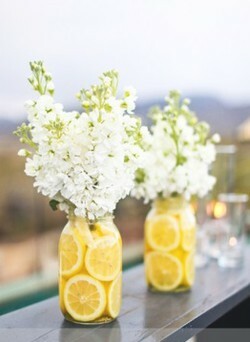 Place lemon slices or halved lemons inside vases or mason jars, to create a fresh and lovely centerpiece. Combine with bright flowers for extra color flare, or white flowers to accentuate the bright yellow of the lemons and the pure white of the flowers. Colourful flowers and lemon vase will bring playful and warm atmosphere at your home.